There were plenty of highlights, and some tight finishes, to report after another big weekend of Demon action. Our women’s 2nds clinched our first finals spot of the season, winning their T20 double header yesterday to finish in top spot and will play off in the T20 final this Friday night against Box Hill at Harry Trott Oval (5.15pm start). 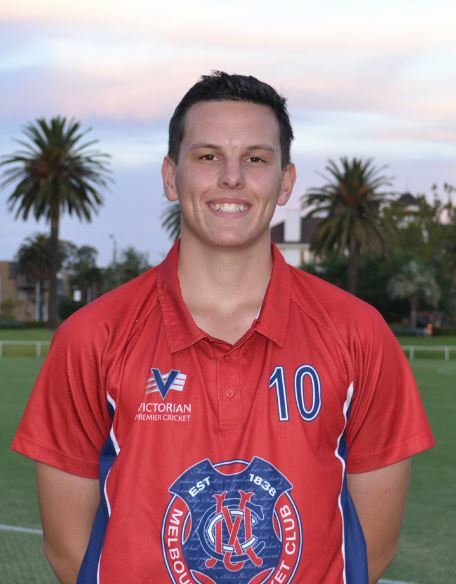 The weekend got off to a flying start when, in the men’s 1st XI, Zac Mevissen (pictured) ripped through Ringwood’s top order to, at one stage, having the amazing figures of 5 for 5 and the Rams 5 for 14. Although they made a slight recovery, Jackson Coleman and Brad Melville chimed in with two wickets each to dismiss Ringwood for 94. We didn’t make the moderate chase easy, finding ourselves 3 for 2 before Matthew Brown (38 n.o.) and Jack Harper (30) guided us safely to a bonus point win. While Zac was running amok at Jubilee Park, Pat Smith (5/38) was doing similar at the Albert in the 2nds. With opening partner Wilson McGillivray (2/23), they had the Rams 4 for 7, three of those to Pat. Unfortunately Ringwood’s 2nds recovery was a little better, reaching 189. Our chase wobbled throughout with the one constant being 16 yo Campbell Kellaway (93 off 140 balls, five 4s). At 7/118 the game looked beyond us however Campbell found lower order allies who lead the bowling attack earlier. The run rate required eked out with few wickets in hand, but Campbell clawed it back to seven required off the last over. Scores were tied with one ball remaining, Campbell sacrificing his wicket being run out trying to steal a bye off the last ball. Whilst the women’s 2nds had a winning double, the 1sts lost their final T20 round. Plenty Valley put 2/135 on the board, both wickets going to Tegan Orwin (2/20 off 4 overs). Our chase was steady with four scores between 20 and 28 however we fell six short at the end. The 1sts will be looking forward to resuming their one-day season against EMP at the Albert next Sunday where they sit 2nd on the ladder. The 2nds had two strong wins against Carlton-Brunswick, winning by 60 and 38 runs. In the first game Kampi Nainhabo returned the remarkable T20 figures of 3/6 off 4 overs, after Charli Killeen top scored with 37 and Jessica Grant made 30. Unfortunately the scorecard for game two isn’t available at the time of writing. The women’s 3rds went down to a strong Coburg outfit. Skipper Jen Donnelly (31) played a lone hand before we were passed three down. Our men’s 3rds came out on the wrong side of a close one. Making 9/177 with thirties to Alex Cesarios and Alex Pellin, the game was in the balance throughout. Will O’Brien (4/30) took two early wickets but from 3/36, the Rams rallied to 4/107. Fortunes ebbed and flowed and when Fergus O’Neill (3/27) took consecutive wickets, Ringwood still needed 25 eight down. The 9th fell with four required that was achieved in the last over. The 4ths continued on their winning way and now head the ladder. Rory Freeman (60 off 76 balls) was the stand out bat, leading the chase of Ringwood’s 5/162. Nick Sirko and Stewart McCooke each took two wickets, while Pat Frawley (26) helped his side off to a good start and Cal Buchanan (20 n.o.) saw the boys home. The Club XI Div 2 team continued their run of much better form, accounting for Old Trinity by 39 runs. Anwar Newkirk (55) lead the way with the bat, following up from his unbeaten century the day before when the Club XI won a ‘friendly’ against the touring Old Mayo College from India. Ben McLeod (30 and 2/30) also had a good double to help restrict the visitors.